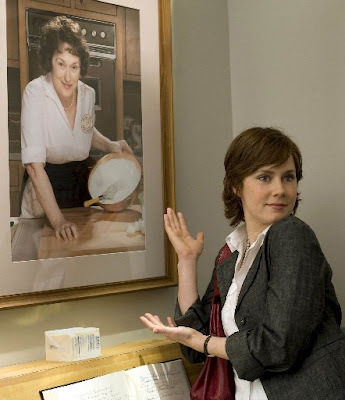 It turns out that I have a rather complicated relationship with “Julie & Julia,” this summer’s sunny hit about the intertwined lives of chef Julia Child (played, in a tour de force, by Meryl Streep) and blogger Julie Powell (Amy Adams). It’s out on DVD today, which gives me an excuse to ponder it in cyberspace for another minute or two. I’ve seen the movie three times now — once to review, once again to watch it with my husband, and once more on a plane six weeks ago. Every time, I have a wildly mixed reaction: The Streep scenes are genius. The Adams scenes — why??? If you, like me, are a connoisseur of romantic comedies, you immediately recognized that Adams is doing Meg Ryan, specifically from “You’ve Got Mail”: the cutely nonthreatening haircut, the perky way she bobs her head when she types at her computer, the childlike whining, the chirpy voice (“I have thoughts!”). It’s a fairly uncanny imitation when you think about it, but it’s no accident — Nora Ephron, who wrote and directed both “Julie & Julia” and “You’ve Got Mail,” wrote the character that way and directed her that way. And here’s where I get frustrated. Ephron (who I have never met) is a famously smart, funny woman whose wit jumps off the page in her many terrific published essays and her novel “Heartburn” (based on her real-life divorce). A recent New Yorker profile described how smart and funny she is, and how revered she is by those who know her. The real Julie Powell (who I met briefly, for an interview last summer) is also a smart, funny woman who despite a tendency toward oversharing (hey, she knows it) is the sort that you immediately want to sit down and have a drink with, knowing she’d be a kick to talk to. She, like Ephron, is complex and interesting. So what does one smart, funny woman do when confronted with another smart, funny woman? She turns her into a cute little thing. Now, Ephron wasn’t obligated to bring the real Julie Powell to the screen — screenwriters can do whatever they want with source material, and Powell’s not exactly a public figure — but why would she drain the color out of her? Why would she make her so uninteresting? Was there studio pressure to make the movie cuter and nonthreatening? Was Ephron just seeking the widest audience possible? How much better could “Julie & Julia” have been if we weren’t disappointed everytime the camera left Streep and moved to Adams? None of this would bother me if big-studio movies about smart, funny women weren’t rare. But they are, and it does, particularly when it comes from a woman who’s famously smart and funny herself. Does it bother you?